Maybe it's because I'm a huge space geek, or maybe it's because I'm Canadian, but I find myself tickled pink about Eric Yam. The 16-year-old from Toronto just tied for the Grand Prize in the NASA Space Settlement Contest. Better yet, just about all of the illustrations and diagrams in his 96-page (!!!) report are Google SketchUp models. It's the most exciting space colony for 10,000 people you've seen all year. You can read all about Eric in this Globe and Mail article from last week. You can even download his report as a full-color PDF. Congratulations Eric – maybe this isn't as far off as most people think. WOW! I mean, I was trying to figure out what a girl was when I was 16 but this kid is out of control! Well done Eric, I really enjoyed reading your report. I'd live on Asten. Very Creative. These kids now a days never cease to amaze me. Eric, when your ready to team up with me to design a an intergalactic space station that that includes a skatepark let me know. Get in touch through californiaskateparks.com. Very well thought through! Great job! I was sad to discover that Asten was not to be found it the 3dWarehouse, at least the different keywords that I tried. 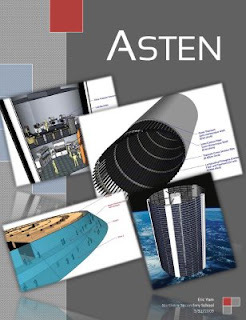 It would be amazing and fun to have access to some of the Asten models! !